Transactional or Relational? Is a project only a business transaction -- exchange one set of assets on the balance sheet (cash) for another set (project deliverables, aka inventory)? Everyone get out their pocket protectors! Or, can a project also be relational -- form a partnership with the business and deliver the best value as judged by business impact? Who among us would argue against partnership? Well, actually many would. You can only have partnership if you have shared reward for shared risk. How is this sharing to be done with a project underway and chartered? The very word "sharing" dilutes control -- if not power -- shifting a bit from the project charter back to the business. But, of course, the business has put up the money -- they've certainly got skin in the game -- so naturally the business believes they are owed the benefits of partnership. The best value thing is usually ok as a planning objective -- like partnership, who would argue against getting the best value? But the devil is certainly in the doing: if the business mucks about in real time with the definition of best value then the whole thing can be a PM's nightmare with shifting and changing priorities and druthers. And then we come to the fuzzy stuff: what's a relationship? As a PM, my visceral reaction is: give me something I can measure so I can go to work and manage it-- no measures, no management! Transactions uber alles! Again: pocket protectors to the front, please! But about relationships: we're talking about reciprocity and flows: reciprocal trust, respect, loyalty, and commitment to shared values and outcomes; flows of ideas back and forth; and flows of risks back and forth. Are these qualities measurable? Are they manageable? (Are those even important questions to ask about the fuzzy stuff?) And, even if they are not, shouldn't we still care about them day to day in project life? I submit that each of us must arrive at answers in our own way in our own value system. But, let's grant for the moment that we see the benefit of joining project transactions with business relationships. What do we get? Among other things we get access to business thinking that may inform project decisions day to day. That's important because it's actionable and ultimately will be reflected in the transactional side (measurable, manageable). And the business may get our attention on mitigating a business risk by making some decision, some choice, some investment that we might not otherwise. Relations can point to branding, qualitites of esteem, and other appeal attributes that would fall into the best value bucket and be beyond a simple business transaction. Is this agile writ large? *If you've read the book (and liked it), please review it where other's can read about it. 1. What is this thing called agile? 2. How do I work agile into my traditional environment? Agile begins with the Agile Manifesto and the Agile Principles, which in the main redirect the project focus to the 'ends' as having a higher priority than the 'means'. The management focus is first on outcomes and results and only second on inputs, like cost and schedule. Agile is a change-driven quality-centric methodology that seeks to deliver "best value": the most important, urgent, needed scope possible for the investment offered by the project sponsor, where maximum fidelity to customer need is the driving factor. And, third, keep to the overall narrative developed first in the business case and flushed out a bit in the project charter. Inevitably, agile in less-than-a-green-field is going to be more constrained than otherwise. And to Point 3, how to get started? You get started with a pilot project. Mike Cohn has some excellent advice on this: pick something important, but constrained. Get the buy-in of a sponsor for the pilot, do some training, line up a coach or mentor, and then give it a go. It was famously said, in a paraphrase: lead people, manage things. I buy into this advice, so I'm always on the alert for something that plays into it. In a recent posting, I read some advice on delivering constructive criticism that seem pretty sensible, given my own experience of being on both the receiving end and the delivering side of such encounters. And, full disclosure: the first time I really had to do this, I really screwed it up! I am constantly amazed at the number of PMs -- presumably experienced -- that I speak with that don't seem to grasp the idea of "process". They all seem to know practices: Risk management, change management, chartering, earned value management, etc, etc. But, ask them about how a practice fits into a process and the veil drops. So, back to "Process 101": Input --> practice --> initial conditions, outcome with controls, constraints, and policies as modifiers/influencers on the practice. See Six Sigma and any of a number of other doctrine -- like PDCA -- about processes and process control. And, this matters because: Because it's about dots, connecting the dots, and having a project narrative to govern by. Narrative is what makes the connection between the business case and the project charter. There's got to be a process to get from 'dot #1' to 'dot #2'. It's probably too much in a "101" discussion to bring in the idea of process networks with nodes, connecting links, link protocols, and work flow. But, if I ever get the "201" level, those will be ideas we'll explore. However, even at the '101' level there should be room for a discussion of 'lean' practices -- some say lean processes -- that try to optimize the value add of the process and minimize the waste of overhead. One approach is to look at batch sizes and try to find the minimization where overhead and batch size seem to work together, and to look at parallel/serial task flow, again with the idea of value add maximization. And, at the '201' or '301' level we might bring in the Theory of Constraints to look at how moving/redesigning a constraint can reduce the cost of the process -- by reducing the cost of process inventory at intermediate steps -- and maximize the throughput. So, with all this stuff, perhaps I should not be amazed, but I still am. Encourage transparency: Sometimes accepted practices "... unintentionally reduce transparency regarding risk. For example, at one .... company, the culture thrives on competitive teams. Competitiveness is so strong that product-development teams use subtly different risk classifications so that their respective projects can’t be directly compared." Respect risk: "Companies often unconsciously celebrate a “beat the system” mind-set, rewarding people who create new businesses, launch projects, or obtain approvals ....—even if it means working around control functions ....." But, in the long run such rogue activity can be destructive by its overall culture of disrespect; others have shown that .... "In the best of cases, respect for rules can be a powerful source of competitive advantage." At first blush, this is not intuitively obvious, by the McKinsey folks say: "... confidence in proceeding [with a risky venture] resulted from an exhaustive risk debate [in accordance with rules and controls] that reduced fear of failure and encouraged greater boldness..."
There's no success individually unless there is success collectively. Inevitably, keeping the team together to promote cohesiveness raises the question: how to keep everyone busy all the time -- other than 'painting rocks' (which is the way the Army used to do it). In the popular vernacular of project management, keeping everyone productively busy means actively managing their downtime, aka 'white space', between and amongst their planned activities. 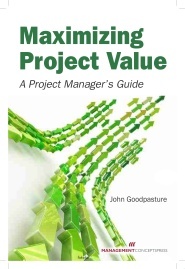 In organizations that are aggressively matrix managed, one approach to 'white space' management is to reassign people to another project with the intention of just a short assignment to 'keep them off the overhead' and always on 'billable hours'. Of course, such practice breaks up the team for a short time so it kind of flies in the face of cohesiveness, team accomplishment, and team metrics. And, aggressive matrix management assumes the F.W. Taylor model of management science: jobs can be filled by anyone qualified for the job description... interchangeable parts, as it were. In the era of team work where teams recruit their members, Taylorism is an anathema. Thus, aggressive matrix management is likewise seen as anti-team. That all brings us to another approach -- more popular these days -- which is: manage the white space by managing the team backlog. Make sure that the backlog has all the technical debt and low priority requirements present and accounted for so that they can be fit to the white space opportunity. The question: Many organizations have created Testing Centers of Excellence. Is there a place for this in Agile or is this approach counter to the intimate nature of Agile? My answer: COE's usually are staffing pools, where the pool manager focuses on skill development, and sends/assigns the skilled staff out to the dev teams. In this regard, the test person from the COE simply joins the dev team. Sometimes, a COE is in the workflow of the project; in this scenario, the release package goes through the COE for some kind of validation testing before release to production. Of course, agile is not a complete methodology if the field is not green; integration/UAT testing with the existing product base often is handled in a traditional sequence, post-agile development. The COE could be responsible for this last testing step. I think this cover says it all. Large scale agile is a bit of a high wire act, but doable. So we read in the May/June 2013 issue of CrossTalk, the Journal of Defense Software Engineering. The lead article, "Scaling Agile Development" is by authors Craig Larman and Bos Vodde, the former known best for his 2003 book: "Agile & Iterative Development" but more recently for a two volume tome about scaling agile, from which this article is developed. In a word or two: OMG, No! At best Larman and Vodde are examples of agile naivete; at worst, they're just plain wrong headed about how to do agile in the defense industry. 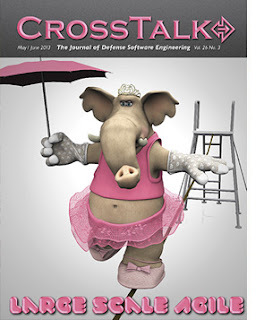 And, it's a shame that Crosstalk, a worthy journal to be sure, but obviously not peer-reviewed, would publish such a poorly conceived paper. Their basic idea is this: Agile, in the guise of Scrum, is scalable to any limit -- thousands of developers they say -- by the simple expedient of adding teams (in 10 person increments) and adding some coordination meetings and tools. Architecture, testing, and management -- unneeded they say except for that which a team can provide for itself -- are unnecessary burdens, even for huge projects. They posit that all this is doable in three frameworks: First the single team for the small projects; second a framework that does for 10 team (100 team members); and then a third framework that is unlimited in its scalability. The differences in frameworks are some overhead services provided at each level for coordination and communication and management of the project-level backlog, and the idea that at the framework 3 level more than one product owner will be needed, and so a committee of product owners will be needed. Indeed, most of the discussion centers on the backlog and how it is to be distributed among teams. At scale, for many skills, like architecture, the authors suggest the benefits of a "community of practice" birds-of-a-common-feather organization plan (I like this idea and it's generally endorsed in the agile large-scale community). I also like some of their ideas about organizing the backlog -- which at scale will be tens of thousands of stories, etc -- into "areas", like protocols, but NOT into such broad categories as "performance". There's no discussion of how these frameworks fit, or could fit, in a contractor/government environment; how the warfighter's interests are to be represented... they certainly aren't present to be the product owners; and how processes that obviously breakdown at scale -- like simple war rooms with sticky notes for stories -- would work with tens of thousands of stories. And, there's no discussion of interfaces to legacy installed base; no discussion of working through defined interfaces or APIs; and no discussion of how other swim lanes (or WBS verticals) would be brought into the project. Even worse in some respects, given the need to honor "other people's money", there no discussion of a business case or how to present large-scale agile in a business case. In short, if these two guys have ever been close to a large scale agile project for real, it does not show. If they have ever tried to build programs and projects for the defense industry, whether business systems or warfighter systems, it is certainly not in evidence. For more of my thinking on agile in the DoD, read this white paper. (Yet again, another disclosure: I worked for the DoD as a project manager and I worked for the DoD as a contract project manager doing software systems development). And, for agile in the waterfall: this posting.